We call this project “Give a Hoot,” for no other reason than that I thought it was cute. You’ll need black construction paper, oil pastels and gold glitter glue for this project. I give a quick lesson on drawing an owl before we start—–I’ve included a site address that is such a great help with step by step instuctions on drawing an owl. It’s such fun to see the different results from the same instructions. More info on this project, “Give a Hoot,” can be found in the 2nd Grade Projects Gallery and in the sidebar. 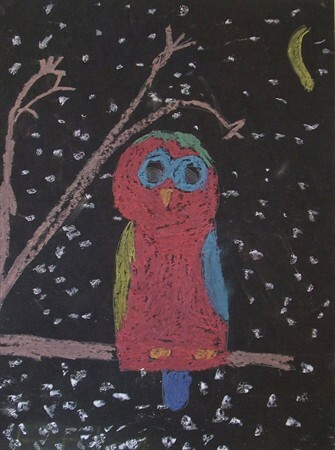 This entry was posted in 2nd Grade and tagged 2nd Grade, art and crafts for kids, art projects for kids, give a hoot, oil pastel art projects, oil pastels, owl, owl art for kids. Bookmark the permalink.